CRAZY DISCOUNT! Was: $699.95 Now: $399.95! Carry all your light and bulky luggage or other additional belongings in the car roof box which has a generous space of 500 litres with a maximum load of 75 kilograms. Designed with aerodynamic shape, the luggage pod ensures to protect and maintain your vehicles fuel economy even for over long distance travelling. Crafted from dual side opening with two locking mechanism, the roof box offers a more convenient and safe loading and unloading process. 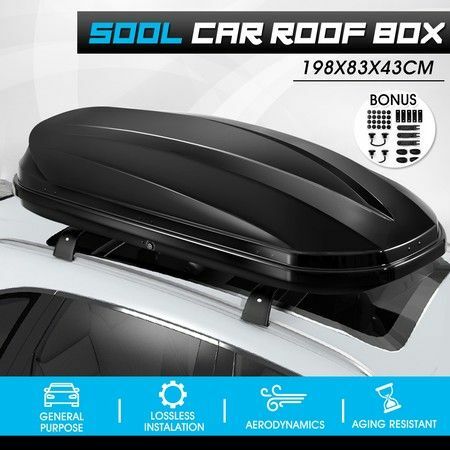 Constructed in ABS plastic, the car roof box is sturdy and durable enough to withstand all the weather conditions and protect your luggage in transportation. The car roof storage box with a glossy black finish will perfectly fit the majority of cars with ease.